The management of individual algal blooms is best undertaken at a local level, as the most effective approaches differ according to each bloom and each location. At a broader scale, a well-established co-operative arrangement through the Murray Regional Algal Coordinating Committee (MRACC) is in place for monitoring and managing blue-green algae outbreaks. The committee includes all the relevant managing authorities in New South Wales, Victoria, and South Australia. The committee puts out public alerts to make sure all water users are aware of problems and know to avoid direct contact with the water. These alerts come out as media statements, signage at sites, and direct advice to groups of river users. Once a blue-green algal bloom occurs, very little can be done to stop it. Frequent testing of algal levels can help with decision-making and finding alternative water supplies for stock and domestic uses if needed. Drinking water supplies may need additional treatment. Flushing the water body by adjusting river flows may disperse blooms and break up stratification. However, this option may not be possible or helpful depending on water availability or the characteristics of a bloom. 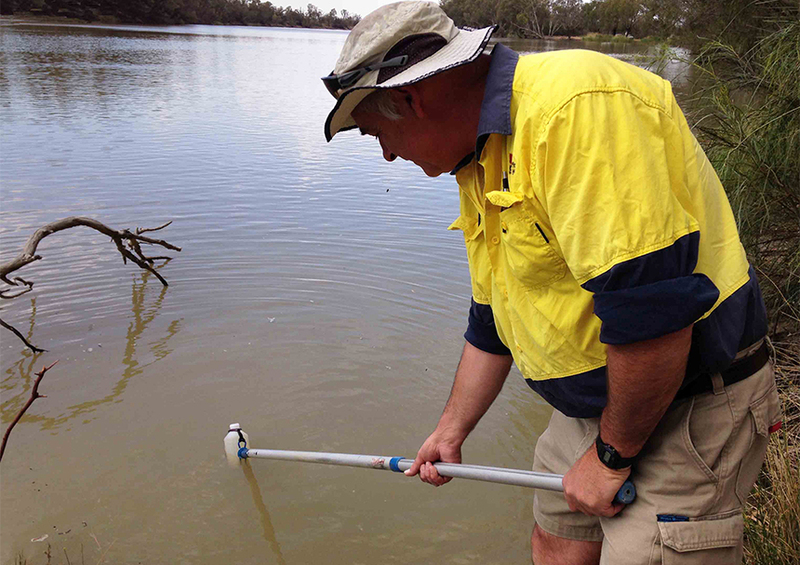 Collecting water sample for blue-green algae in Merbein, New South Wales. Photo by Dr Tapas Biswas (MDBA). We do what we can to help the local authorities manage algae. On behalf of Basin governments we run the River Murray system and our river operations factor our water quality monitoring into their decisions. This helps reduce the likelihood and intensity of blooms. Sometimes we can help manage algae by varying flows and providing additional flows. However, the amount of flows needed to disperse algal blooms are not always available, they may not reduce the problem and can even risk spreading blooms further. Sometimes partial draw-downs of weir-pools can also help reduce stratification. Under the Basin Plan, all water managers including us should keep water quality targets in mind. Special targets for recreational water quality are also in the Murray-Darling Agreement (see chapter six of the guidelines). Blue-green algae have always been present in the river system and blooms are a natural phenomenon. In 1830, Captain Charles Sturt recorded the Darling River as tinged with green and tasting of vegetable decay. In 1878, the blue-green algae, Nodularia spumigena, bloomed in Lake Alexandrina causing the death of animals that drank the water. In the Darling River in 1991, a toxic bloom of blue-green algae occurred over a distance of 1,000 km and caused the New South Wales government to declare a state of emergency. Extensive blooms have occurred throughout the River Murray between Hume Dam and Euston in 1983, 2009, 2010 and 2016. In 1980, the Murray Darling Basin Commission (our predecessor organisation) initiated regular assessment and collection of phytoplankton data (algae and cyanobacteria) in the River Murray and its major tributaries. In 1994, the Murray–Darling Basin Ministers adopted an algal management strategy as a framework for the algal management efforts of each state. The algal management strategy emphasises nutrient reduction to address the underlying cause of algal growth. In 2009, the New South Wales Office of Water developed the River Murray algal bloom management strategies following extensive blooms which occurred in the River Murray that year. Following 2009 and 2010 widespread algal blooms in the River Murray, the Murray Regional Algal Co-ordinating Committees (MRACC), comprising members from New South Wales, South Australia, Victoria and Commonwealth was formed to coordinate reporting and management of algal blooms in the southern Basin. A 2011 blue-green algae report on the long-term trend analysis of phytoplankton in the Murray found the amount of algal blooms has not changed much within the river system over the period between 1980 and 2008. However, higher frequencies were recorded at upstream sites and lower frequencies at downstream sites. Blooms can start as small green floating dots and develop into thick, paint-like scums on the water surface. They are often green or blue-green in colour, but may also appear white, brown, blue, yellow-brown or red. As identification can be difficult, if blue-green algae is suspected, it is important to avoid direct contact with the water and contact the appropriate local council or water supplier. Information about blue-green algal blooms and red alert warnings can be obtained from the Regional Algal Coordinating Committee's algal information hotline on 1800 999 457 (freecall).